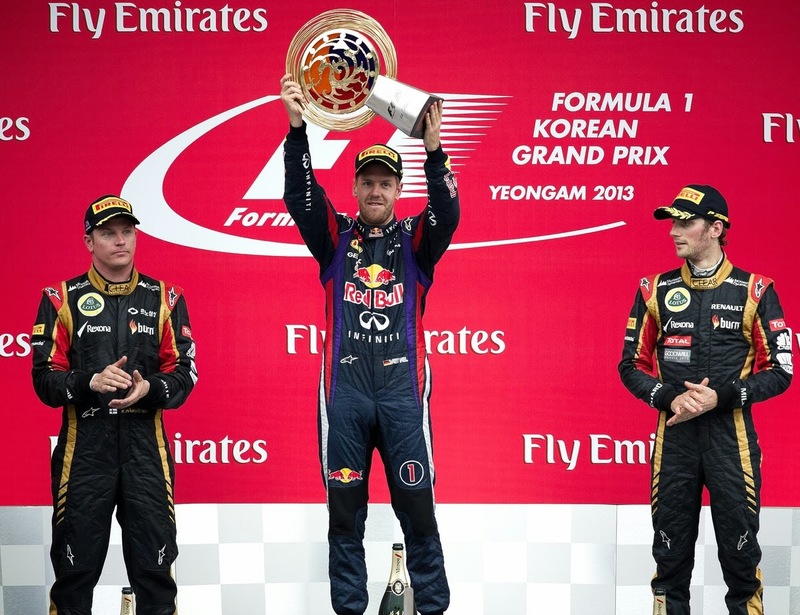 Sebastian Vettel emerges the winner yet again after an incident-packed Korean Grand Prix. In a race that had it all, the German would further solidify Championship hopes. Boring this F1 racing isn`t it? Just the same old same old race after race.. not today! Great start for Seb who held the pole lead into the first few corners. Massa gets brave into turn 2 but ran out of space and spins under braking nearly collecting his team mate but causes some minor damage to other cars trying to avoid hitting him. Grosjean overtakes Lewis Hamilton who struggles to match the Frenchman`s pace on cold tyres. By the end of lap 3 Vettel had pulled out a 2.7 second lead over Grosjean and Hamilton. As the race progresses the first round of pit stops start on lap 8 and the leader Vettel comes in on lap 12. Mark Webber, Kimi Raikkonen and Fernando Alonso all make places up and start to put pressure on their rivals. Every position he could make would be vital for Alonso`s slim championship hopes. Talking just before the race "It doesn`t matter where I finish today, as long as I finish ahead of Vettel!" On lap 24 Lewis radio`s his team to tell them "The right front is destroyed!" He starts to lose a lot of time as he struggles for grip. The team wanting him to stay out in order to fit with their 2 stop strategy. Meanwhile on lap 26 Paul DiResta runs out of talent at turn 12 and goes off ending his race! Key moment for Mark Webber on lap 27 as he overtakes Alonso for 5th place. Lewis falls back into the clutches of his team mate who catches him easily with his shot tyres! As Rosberg overtakes Hamilton his nose and front wing become detached showering the track in sparks! He then pits for a new nose. With Nico in the pits, the Mercedes team are unable to bring Lewis in who radio`s "When are you gonna call me in? These tyres are ******!". Lap 30 sees Lewis come in but the damage to his race has been done and he comes out in 6th. Lap 31 sees a sudden tyre delamination on Sergio Perez`s right front tyre which brings out the Safety car. On Lap 37 the Safety Car pulls into the pits and we are racing again. During the restart, Adrian Sutil locks up and spins hitting Mark Webber who in turn is knocked off the track and a fire breaks out in his engine. After what seems like an age Webber eventually gets out of his car and calmly walks round it trying in vain to put the fire out! Then comes one of the craziest scenes I have seen for a long time as a fire jeep just drives out onto the track in front of the leading pack! That forces Charlie Whiting, the race director, to deploy the Safety Car once again. The fire truck then swerves across the track in order to get to Mark Webber`s trackside BBQ and eventually the fire is put out! I suspect the chief Fire Marshal will no longer be in a job come Monday morning! GIF: After Webber's car caught fire, a fire truck was deployed without permission. The remaining 10 laps are frustrating ones for Lewis as he struggles in vain to pass Nico Hulkenberg for 4th and only just manages to keep his position from an attacking Fernando Alonso by the end. My driver of the day?.... Nico Hulkenberg. Needs a top seat next season!! We had almost forgotten Vettel was in the race but he was there once again taking the win and surely now the 2013 F1 World Championship will be his. Mathematically it could happen at the next race, Suzuka, Japan! 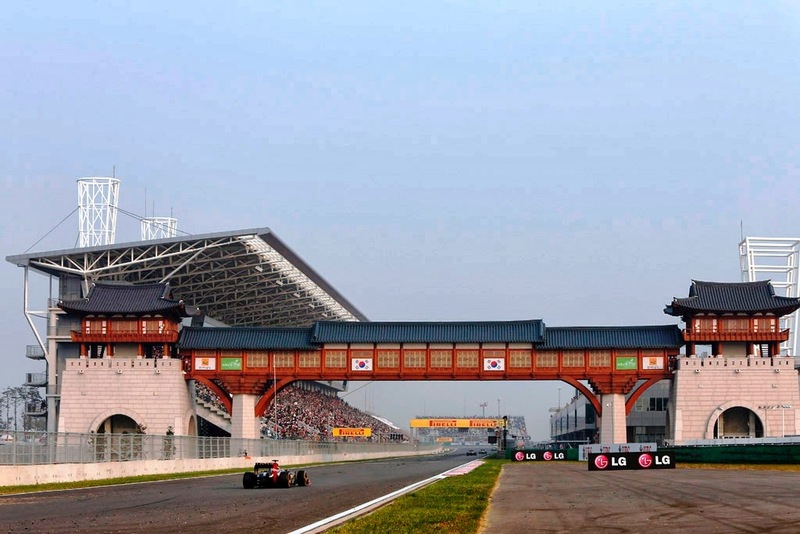 Race report for the F1 Korean Grand Prix.